Ferraris may get all the status-endowing, eight-figure auction hammer prices, but no Italian marque showboats quite like Lamborghini. With their irrepressibly bombastic (and occasionally indelible) design, vintage Lambos are beloved up-and-comers within the collectible car market. Over the past five years, Miuras have become seven-figure cars. Countach values have quadrupled over the same time period. Even the formerly mocked Espada has seen triple-digit increases. With all of this money flowing around Sant’Agata’s vintage bulls, it only makes sense that the parent company—which currently receives bubkes when one of their old cars sets a new auction record—would want to get in on the action. Hence, the recent creation of Lamborghini PoloStorico, a division of the company that, despite the name, has nothing to do with Ralph Lauren, ponies, or debonair Argentines. The name translates to “Classics Hub,” and has been created to support vehicles from the manufacturer’s fifty-plus-year history by providing services to owners, buyers, and sellers. These include access to original factory documentation about what a particular car looked like when it rolled (or perhaps was pushed) off the assembly line, intensive onsite inspections that might involve the removal of body panels, and the opportunity to have the turquoise ostrich hide on your Urraco or 24K gold trim on your LM002 restitched or replated by possibly the very same craftsmen who assembled it in the first place. How exactly does Lamborghini profit from this? The same way that their peers at in-house heritage centers like Ferrari Classiche, Aston Martin Works, and the Mercedes-Benz Classic Center do: by selling authenticity. The early fruits of PoloStorico group’s labors are indisputably beautiful. This is evidenced in the perfect, Verde Metallizata 1971 Miura SV400 the Storico team had on hand at Amelia Island, the first car to undergo a meticulous full restoration at their shop. This car originally appeared on the Bertone stand at the Geneva Motor Show in 1971, as Lamborghini’s own stage was occupied by the first unveiling of the outrageous Countach. “As this was the first Miura SV model, we still had many prototypical parts—not production, different from production” says Enrico Maffeo, Lamborghini’s heritage and factory sales experience manager. “Our job in the restoration was to interpret this SV with those mistakes, so to speak, that were there originally.” These included trim pieces like headlamp surrounds, tail light surrounds, and air intakes, as well as more substantive suspension and engine modifications. We had a chance to walk around the car, and even to touch it and make vroom-ing noises inside our slobbering mouths while we imagined driving one (again). 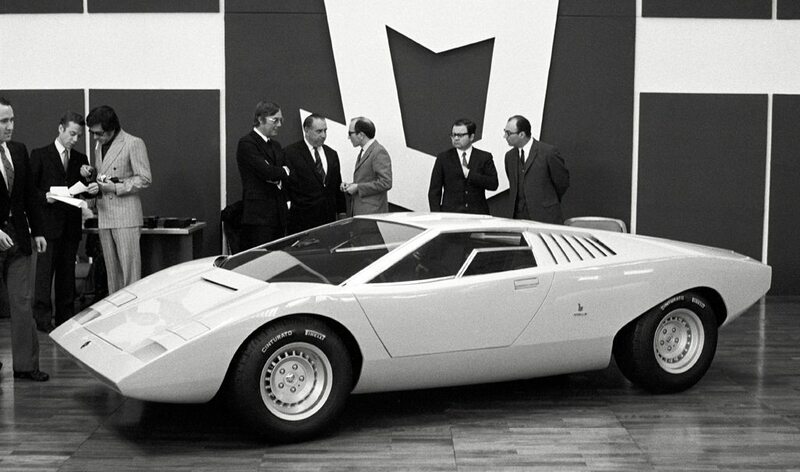 But more important than the team’s demonstration of this one splashy success is the Lamborghini brand’s long-term plan. With quality and production numbers ramped up to the point of profitability, and generous backing from their German benefactors at Audi, Lamborghini can finally act like a successful robber baron industrialist and focus on its legacy. Expensive, factory-sponsored restorations and certifications not only boost profit but elevate the price of the brand’s cars at auction. Comer claims that Ferrari’s Classiche certification can add as much as twenty-five percent to the price of a vehicle. Ubiquitous to the point of near necessity, the marque’s official stamp has thus raised overall values on vintage Ferraris. Lamborghini doesn't want a piece of that pie—they want to bake their own.